The Completer example shows how to provide string-completion facilities for an input widget based on data provided by a model. 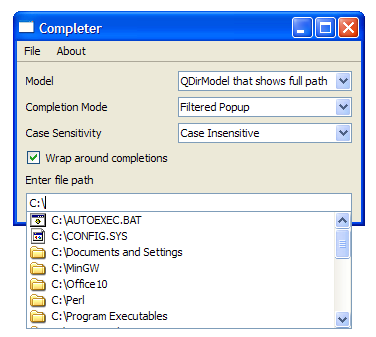 This example uses a custom item model, DirModel, and a QCompleter object. QCompleter is a class that provides completions based on an item model. 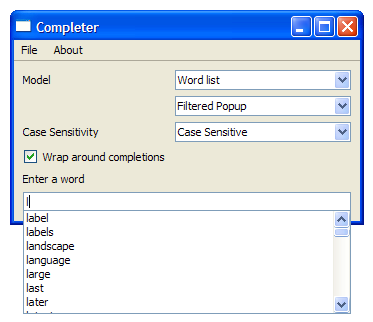 The type of model, the completion mode, and the case sensitivity can be selected using combo boxes. The DirModel class is a subclass of QDirModel, which provides a data model for the local filesystem. This class only has a constructor and a data() function as it is only created to enable data() to return the entire file path for the display role, unlike QDirModel's data() function that only returns the folder and not the drive label. This is further explained in DirModel's implementation. 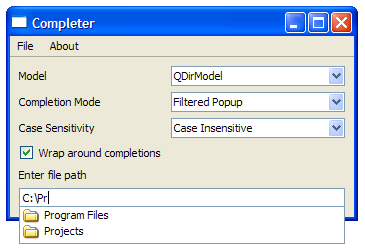 The constructor for the DirModel class is used to pass parent to QDirModel. As mentioned earlier, the data() function is reimplemented in order to get it to return the entire file parth for the display role. For example, with a QDirModel, you will see "Program Files" in the view. However, with DirModel, you will see "C:\Program Files". The MainWindow class is a subclass of QMainWindow and implements four private slots - about(), changeCase(), changeMode(), and changeModel(). 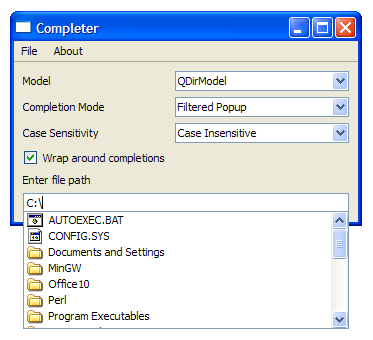 We set up three QComboBox objects, modelComb, modeCombo and caseCombo. 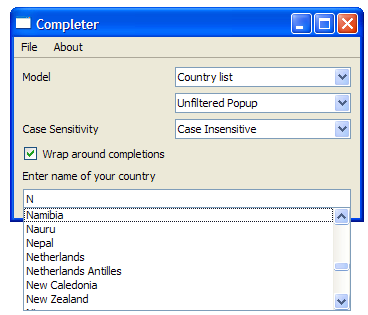 By default, the modelCombo is set to QDirModel, the modeCombo is set to "Filtered Popup" and the caseCombo is set to "Case Insensitive". The mouse cursor is then overriden with Qt::WaitCursor before we fill a QStringList object, words, with the contents of file. Once this is done, we restore the mouse cursor. A switch statement is used to change the item model based on the index of modelCombo. If case is 0, we use an unsorted QDirModel, providing us with a file path excluding the drive label.